No! Come back! Low fat desserts are not horrible. I swear. Okay, so it’s not a German chocolate cake, but it’s simple, it’s easy, and it tastes good. And yes, it’s pretty low in fat since it’s basically yogurt with some spices and a bit of sugar and maybe fruit. Shrikhand is a dessert from India where many dishes are milk-based and most are pretty rich. Ghee is the best part of butter and it’s in everything. Except this dish of course. You’ll need only a few things, and as ever, good ingredients make all the difference. First of all choose a good yogurt, preferably natural, organic, whole milk, etc. Yes, pick the highest fat content type. I love the cream top style from Stonyfield. You’ll want a 32oz/2 lb container for this. It serves about four people. You’ll need about a 1/4 to 1/2 teaspoon of ground cardamom. If you don’t know if you like cardamom or not yet, I’d use a smaller amount because it’s easy to use too much. Cardamom is great in coffee by the way. If you use a French press, sprinkle some in with your ground coffee before you add the hot water. Tasty! Confectioners sugar is easy to come by. You’re going to need about a half cup of finely ground sugar because the yogurt will be too dry and cold to dissolve regular sugar well. Got it? Half a cup. Once you have made it a few times, you could adjust up, but the sweet tends to overpower the other flavors. And last but not least, saffron. Possibly the most expensive single substance on the planet by weight. Never cheap-out on saffron. It’s just not worth it. The good thing about saffron is that it goes a long way, so you only need a little. You can get Spanish saffron pretty readily. Look for the highest percentage of red saffron strands you can find or afford. The red strands have the most flavor; yellow has less. If you can get your hands on Indian saffron, consider yourself lucky and pay whatever price is asked. You only need about five threads of saffron for this recipe. I’m going to shamelessly plug one of my favorite spice catalogs for a minute, and you’d best pay attention because they’re good people and have a good selection of reliable-quality spices. Take yourself over to www.penzeys.com and request a catalog. I always buy online, but the catalog covers a good deal of what they have and has fun recipes to try out. They know spices and they know customer service. 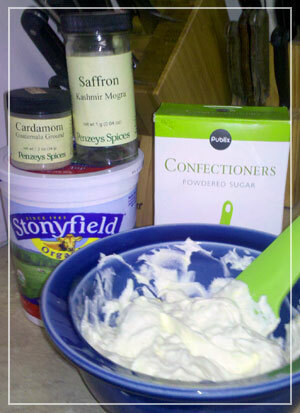 So back to shrikhand… and the weird things you’ll need to “cook”. (Yes, there is no actual cooking involved here, so it’s actually a kid-friendly recipe.) You’ll need a small mixing bowl, a medium mixing bowl, a spatula or wooden spoon, a two-by-two foot section of cheese cloth, and a metal strainer. Line your small mixing bow with the cheese cloth. Bring all of the edges out neatly because you’re going to be wrapping this up around the yogurt in a minute. If you chose cream top yogurt or other creamy style, you’ll need to mix it up as much as possible so it’s pretty even consistency. Pour the yogurt into the bowl/cheese cloth, then pull all of the edges of the cloth up tight around it like a little hobo running-away bag. You can tie it off with twine, ribbon, twist-ties, what ever. I twist it up and use one of those wooden clothes pins because I find them very handy in the kitchen. You’ll see fluid already escaping the fabric. This is the excess whey, and the more you drain off, the better your shrikhand will be. Carefully plop this cloth covered yogurt in the strainer you’ve propped in your medium bowl. The whole goal here is to let the moisture drain off the yogurt, drip through the strainer, and collect in the bowl. So you can check every hour or so and pour out the whey in the bowl as it collects. Put bowl, strainer, and yogurt in the fridge like this for at least four hours to drain. The more ‘natural/organic’ your yogurt, the faster it will drain. Four hours is minimum. I usually let it go over night, or at least 8 hours. Like I said, the more moisture you drain out, the better the shrikhand is. You’ll even consider re-tying the top because the body of the cloth-covered yogurt will contract. After your shrikhand is drained, pull it out of the fridge and unwrap it. It’ll seem more the consistency of soft cream cheese. Roll it around gently in your hands to get it all off of the yogurt off the cloth, then scoop it into a mixing bowl. First the 1/2 teaspoon of cardamom. Then roll the saffron threads between your fingertips to break them up a little and drop them in. Mix this up and return to the fridge for about a half hour. Add the powdered sugar and mix well, then return it to the fridge for another half hour. Mix one last time and you’re good to go. Always serve shrikhand chilled. I like to serve this in a bowl with fresh fruit. Peaches are great because they don’t overpower the subtle saffron flavor. Or drop some mango puree in there with it and a drizzle of honey. If you get it thick enough, you could pretty much ice a cake with it, which could be fun. This is great to serve after a spicy Indian mean because it’ll cool off your guest’s sizzling tongues and offer a gentle flavor after the big fireworks of curry. You can find many variations of shrikhand flavors depending on what gets mixed in. Mango puree is great as long as you drain and press as mush fluid out as you can. Or finely chopped pistachios is another traditional addition. I suggest having fun with it. Just go for lest wet additions and you’ll be okay. If you want to save it over night, you’ll see it continues to separate. Just pour out the excess fluid and stir it up. Good for a few days in the fridge.